This was the inaugural revenue flight for Lufthansa’s new premium economy seat on board a newly-delivered Boeing B747-8 from London Heathrow to Washington Dulles. The seat was unveiled in Berlin in March 2014 (for the news piece click here and for pictures from Lufthansa in widescreen on this website, click here). 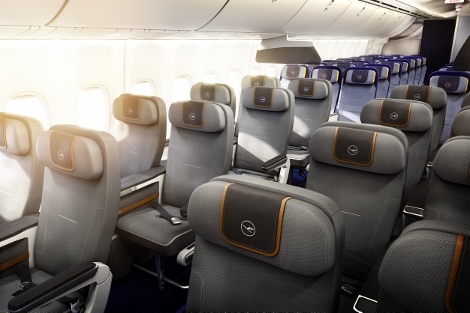 Lufthansa says that the roll out of the new seat will happen extremely quickly, meaning that “some 1.5 million passengers per year will have the opportunity to choose extra comfort and quality at affordable prices”, according to Commercial Director Jens Bischof. By the beginning of December the whole of the B747-8 fleet will be fitted, and make up ten per cent of the entire seating capacity on each wide-bodied aircraft. See here for seatmaps and more information. Lufthansa will fit the Airbus A330-300 aircraft (with 21 premium economy seats) and A380-800 (with 52 new seats). The airline has ordered 19 Boeing 747-8 aircraft, currently has 15 aircraft and the order will be completed in 2015. Passengers in premium economy have a baggage allowance of two items weighing up to 23kg each (twice that of economy). Check-in and boarding procedures as well as hand luggage regulations are the same as in economy class. Lufthansa is quoting prices of Euro 1,199 for return flights to Washington D.C in premium economy and €1,249 to Beijing though it would not quote a typical percentage of how much more premium economy would cost when compared with economy (or business), only that the price is closer to economy than business. Having said that, some of the prices we were quoted showed a premium of around 75 per cent on the economy fare. The carrier is also saying that to book premium economy, existing economy class passengers can upgrade from economy by paying only the difference between the two fares (more on this in the comments below). I had connected on to this flight from London, and so went through security at Frankfurt airport and made my way to gate Z52 where a crowd was already preparing for boarding. Flight LH418 was departing at 1310 and was aircraft number D-AIYQ — the first in the Lufthansa fleet to offer the new seat. On this occasion we did have priority, so we could be first on board and have a quick look round the first and business class cabins before going through to the front of the economy cabin where premium economy occupies four rows. 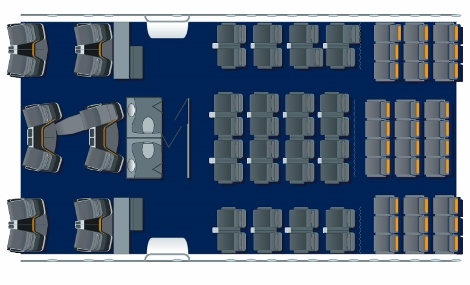 On the B747-8 there are a total of 32 new seats in a 2-4-2 configuration (in contrast to the 3-4-3 of economy, immediately behind the premium economy section). These are completely new seats, and different from the economy seats behind – it is not an “Economy Comfort” type product with leg room being the only difference, but a different seat. Although this was a new aircraft, the retrofitting of the aircraft has resulted in the economy cabin losing seats at the expense of the new premium economy section. So in the case of the B747-8, this means that six rows of economy class seating of 3-4-3 have been removed (60 seats in all) and replaced by four rows of premium economy seating (2-4-2) making 32 seats. Interestingly, the only divide between economy and premium economy are some shades hanging between the seats. I even saw a passenger in the front row of economy bang his head on it. I asked why they hadn’t just enclosed the cabin — given the fact that these are new seats in a new configuration, and so could hardly slide the curtain back and forth depending on demand for premium economy in the same way airlines do with the business class cabin now on short haul. There seem to be two main reasons. Firstly, doing so would have taken up some valuable room on the aircraft, perhaps at the expense of an additional row of seating. The other is psychological. 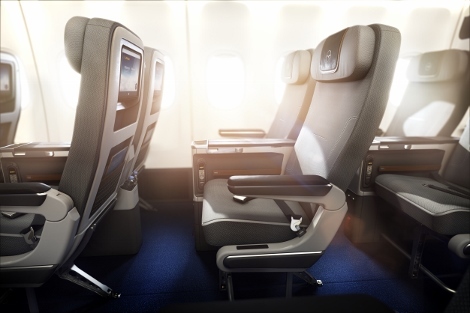 Lufthansa does not want the premium economy section to become a threat to its business class but instead a temptation for people to upgrade from economy. For that reason, it has waited to introduce it until it has fully-flat seating in business class, thus creating a clear divide and reason for those flying business to remain in business. Jens Bischoff told me that on some 40 per cent of its long haul routes Lufthansa is competing with an airline that offers premium economy, so it became important for the airline to similarly offer the product, but also to make sure that it was pitched in a way that did not encourage passengers to downgrade from business class. 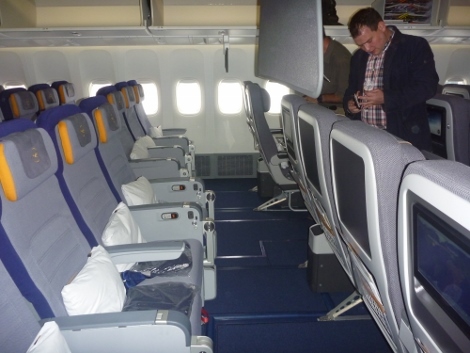 The seat is clearly wider than economy, with Lufthansa saying “depending on aircraft type” this is up to three centimetres (the wider figure is on the A380). It also has “approximately ten centimetres more room at the side thanks to each seat having its own wide armrest and a centre console between the seats”. Again, there’s definitely more room, but it’s difficult to consider how this is measured. The angle of recline is eight inches down to a quoted 130 degrees (presumably from the horizontal seat to the angle of the seat back when reclined) and the seat pitch is 38 inches. The head rests have wings that can help support your head when the seat is reclined, and there is a high adjustable foot rests on all rows except the front row where there is an integrated foot rest. Each seat has a water bottle holder, with water supplied, and individual laptop power. There’s also a USB port under the 11-inch screen, and a small holding area for glasses or a phone or iPod that is being charged by the USB, although for a charge to take place you would have to turn off the device, otherwise a warning comes up saying the device is taking too much power. I did this and it had fully charged from almost empty after a few hours. It’s important to realise that although there is more room in this seat, it is still very difficult to work when the person in front of you reclines their seat and is only really possible if you recline as well. I worked out an arrangement with the person behind me (a fellow journalist) so we could both work. I partly reclined my seat to give me room to work once the person in front of me reclined. Without that, I wouldn’t have been able to continue. In addition, the seat has a fair amount of “give” in it. This means if someone is using the touchscreen on the back of your seat, you will feel it. And when someone has to get out from the window seat, if they put their hand on the top of the seat next to them to lever themselves out, it flexes alarmingly towards you if you are sitting behind. It’s fine if you are fully reclined, but otherwise, again, you are aware of a lack of space. There’s no way around this if you have this angle of recline and once the seats are reclined it is very difficult for passengers to get in and out of the window seats. The seat is comfortable for sleeping, comfortable, and I didn’t notice the lack of the leg rest, making do with putting my feet either on the floor or on the foot-rest, depending on the position I was in. When you recline, the seat itself moves forward to increase the angle you enjoy, although this does mean that the remedy of reclining the seat to retain some room to work means you are at an odd angle if you really want to carry on typing, for instance. The obvious choice is the first row – it has by far the most leg room, and in the case of seats 22 AC and 22HK the door is in front of you. That said, because there is no real divider between premium economy and economy, plenty of economy passengers come forward to use the washrooms at the front of the cabin. As a result, these choice seats in row 22 have no privacy, and also a clear view into the washrooms, which means your lasting memory of the flight is likely to be the door opening and shutting, and the light from the washrooms shining on you. For that reason, I’d go for the middle seats, perhaps on the aisle, although you will also have people leaning on the back of your seat waiting for the washroom. It was particularly noticeable after the meal service, when we had half a dozen people queuing for the washrooms along the aisle for quite some time, including people leaning on the back of the aisle seats, doing stretches, and watching our IFE for us. It can feel very cramped when people are passing one another in the aisle to one side of you, and you have the seat in front of your reclined at your front. I lost count of the times I was suddenly aware of someone standing at my shoulder. I’d also avoid the back row because enjoying your extra recline at the expense of the front row of economy is psychologically not great. My choice, therefore, would be front row, in the middle, or a window seat in rows 23 or 24, away from the aisle. You won’t have much of a view out of the window because you are above the wing, but then that applies to the whole of the premium economy section on the B747-8. We were given a non-alcoholic orange juice-based drink, and then headphones were handed out, although I think it would make sense for these to be at the seat since the IFE was working for at least 30 minutes before they were handed out. The IFE has a touchscreen but can also be controlled by the remote control, which serves as a controller for video games as well. 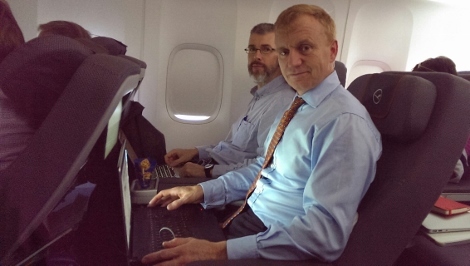 The screens are 11 to 12 inches (28 to 30 centimetres), at least two inches bigger than the screens in economy, depending on the aircraft type. My IFE worked fine, but then stopped working, and despite two resets would not restart (the screen was blank). Eventually they had to reset all four seats in the line (22H, 23H, 24H, 25H). The commercial director Jens Bischoff was in 22H, but he was chatting and so it didn’t interrupt his inflight entertainment at least. It was then reset again about half an hour later. This was ironic, because I was trying to watch the film Edge of Tomorrow which is about a groundhog type of situation where Tom Cruise keeps reliving the same battle trying to work out a way of not getting killed. Each time the film reset, likewise I had to go back to the beginning, fast-forwarding to the last part I had viewed. I’m not sure the hours I spent watching this film can be justified. I did eventually get to the end. I think. Wifi costs €9 for one hour, €14 for three hours and €17 for the duration of the flight. On this flight the wifi was temperamental, and stopped working sevral times for prolonged periods. I don’t know the reason for this, although giving 25 journalists a free pass to use it probably meant it was overloaded with the pictures and social media updates they were posting. On previous flights I’ve remarked on how few passengers pay to use this service — perhaps in time it will grow, but I’d think this would only happen if the prices come down. 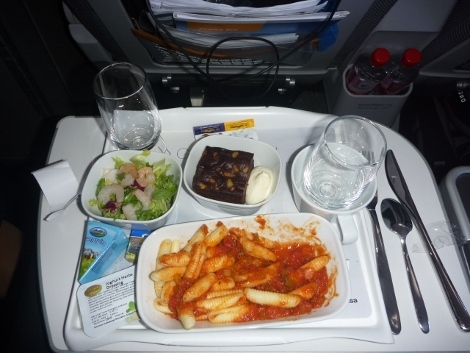 The food is the same as served in the economy cabin, but the main course is served on porcelain tableware. There were drinks served with the meal, with a choice of wine. Spirits were offered afterwards. The meal portions weren’t large, and for a flight of eight hours duration where many of us had not been in a lounge beforehand and had been making a connection, I think perhaps more food might be offered. Of course, this is what they get in economy, but if I fly in economy, I take snacks on board, whereas I don’t normally if I’m flying premium or business. I worked for most of the flight. 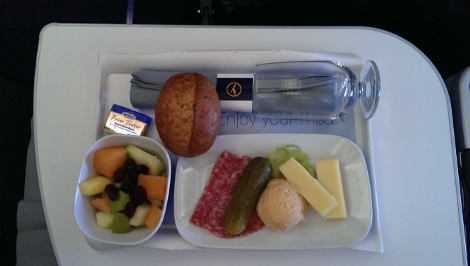 Regular soft drinks were brought round, and then, about 90 minutes before landing, a snack of Milan Salami, Emmental and Bavarian cheese spread obatzda, followed by fruit salad for dessert. We landed without delay and on-time at Washington Dulles, and were quickly off the aircraft, via airbridge. Of course, then there is the shuttle in the buses. Immigration took around 20 minutes and our bags arrived shortly afterwards. A welcome addition. 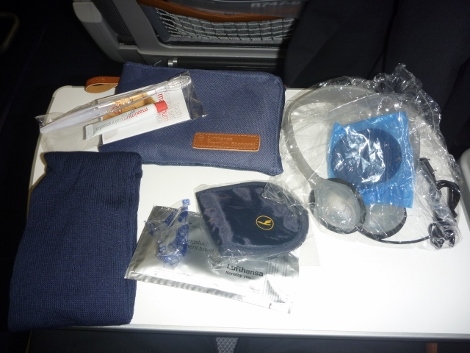 Lufthansa has pitched this as an upgraded premium economy product and as that it succeeds. If you are planning on working for a long-haul day time flight, it’s possible, but be prepared for some inconvenience if on a laptop. The seat is good for sleeping.